Following months of speculation, Chase & Status have announced their RTRN II Jungle series, touring the UK in Autumn and taking influence from the legendary Jungle scene of the ’90s. 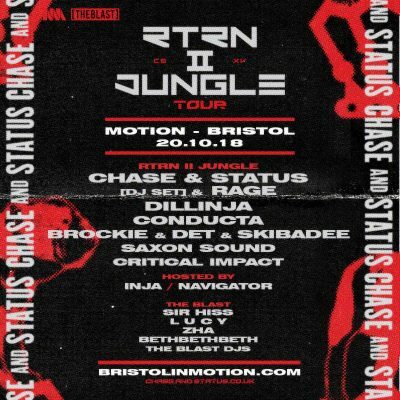 For the Bristol stop, they will be joined by Jungle & DNB heroes Dillinja, Brockie & Det and Skibadee, sound system legends Saxon Sound, the new prince of garage Conducta, and Bristol’s own Critical Impact. Room two will be hosted by The Blast, featuring sets from some of the best new talent in dubstep and grime: Sir Hiss, L U C Y, Zha and bethbethbeth plus Blast residents on support in both rooms.